This is a brief summary of the VA’s reasons (excuses) for not marking the graves of the 3,501 American soldiers buried in Salisbury National Cemetery. More details are available on request. (1) Any individual buried in a national cemetery or in a post cemetery. (2) Any individual eligible for burial in a national cemetery (but not buried there), except for those persons or classes of persons enumerated in section 2402 (a)(4), (5), and (6) of this title. (3) Soldiers of the Union and Confederate Armies of the Civil War. 1st Request – 2003 – That’s too much work. After several letters and telephone calls to the VA went unanswered Ms. Leach (quoted above) called me. 3rd Request – 2010 – A Poor Excuse is better than none. Between 1906 and 1912 the Commissioner for Marking Confederate Graves marked the graves of Confederate POW’s who died “in the North”. When the exact location of individual POW’s grave in a cemetery could not be determined the Commissioner erected a monument in the cemetery. Bronze plaques with the names of the soldiers buried in the cemetery were then attached to the monument. After US Senator Richard Burr intervened the VA installed an “interpretive marker” in honor of Medal of Honor recipient Lorenzo Deming who died at Salisbury. The monuments to Confederate dead were “… a special recognition unrelated to the Federal Government honoring Union dead.” – In 1912 the Commissioner for Marking the Confederate Dead erected a monument in Woodlawn National Cemetery to mark the mass grave of 49 Confederate POW’s who were killed in a train wreck. The monument also lists the names of the 17 Union guards who are also buried in the mass grave. Since the Roll of Honor for Salisbury also listed the cause of death for most of the prisoners I knew the information came from hospital records. However the archivists I spoke with on my prior research trips to the National Archives could not help me locate the hospital register. After the Archives began updating its cataloging system I located the hospital register in August 2010. That should have ended the VA’s excuses. It didn’t. 2010 – 2013 – We Lie to members of Congress too. Our rules prevent us from marking the graves because we don’t know the name of every soldier buried there. – There are too many precedents to list here. The cemetery is listed on the National Register of Historic Places. – The cemetery was on the register when the “interpretive marker” for Lorenzo Deming was installed. Senator Burr’s aide told me the list of deaths at Salisbury that was published in the New York Tribune it was the “smoking gun” we needed to mark the graves. – I emailed the article to Senator Burr’s aide that day. The VA never responded. Over the years a number of people who have relatives buried at Salisbury have contacted me. I always advise them to contact their Congressmen. After members of Congress from several states questioned the VA about the unmarked graves at Salisbury the VA prepared a “Fact Sheet” about Salisbury. This “fact sheet” has numerous omissions and errors. 4th Request 2013 – We don’t care what Federal Law requires. In my March, 2013, request I pointed out to the VA that Federal Law [38 USC § 2306] requires the VA “upon request” to supply headstones or markers for “Any individual buried in a national cemetery” and Union Soldiers of the Civil War. Undersecretary Muro did admit that the Roll of Honor lists the names of men who died at Salisbury. In fact he stated that a copy of the Roll of Honor will be kept in the cemetery office and the list will be accessible through the National Cemetery Administration’s website. By making the Roll of Honor available the VA has admitted that a list of men who died at Salisbury exists. In 2005 a VA historian claimed the Roll of Honor was simply a list of names of soldiers who were confined at Salisbury. 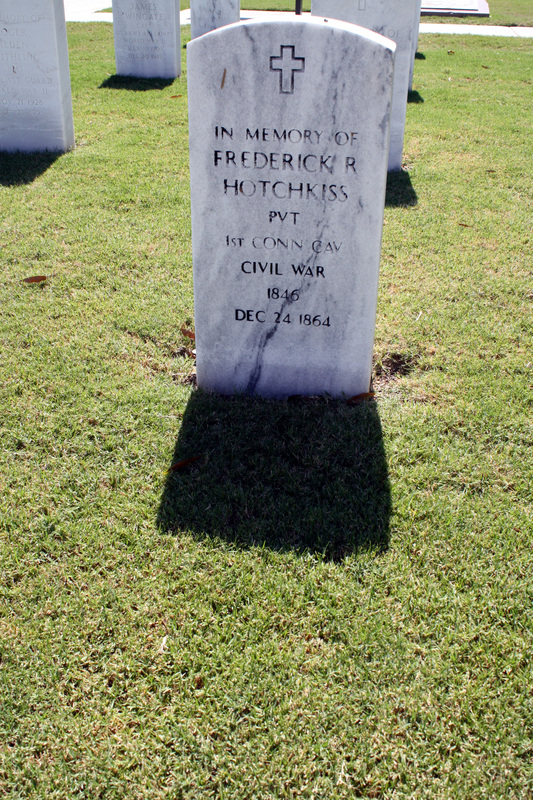 In my 4th Request I pointed out that the VA had erected a “memorial marker” for Private Frederick Hotchkiss within a few yards of the US Monument. Hotchkiss died at Salisbury on Christmas Eve 1864. The VA “invest aged” and eventually claimed that the marker was erected “in error”. If the VA can erect a marker for one man who died at Salisbury they should be able to properly mark the graves of the rest of the men buried at Salisbury. 5th Request – 2015 – We mark Confederate graves. We don’t mark graves of United States Colored Troops. The VA supplied headstones to mark the graves of the Confederate prison guards who died at Salisbury. The VA denied my request citing the excuse they used in 2014. The VA’s claim that the Confederate POW’s had been inscribed on a monument that was moved elsewhere is invalid. The names on the Confederate monument came from the prison’s hospital register. The VA never explained why they supplied markers for the Confederate prison guards but not the Inion prisoners who died at Salisbury.